A free Windows application which converts Trimble calibration (CAL) files containing local site or map projection data into a Topcon localization (GC3) file for use in Machine Control. We are hoping to add more conversions into the toolkit, so please keep an eye on the website or monthly e-bulletins for news about updates. If you have any similar requirements or are a distributor wishing to add new conversions then please let us know. IMPORTANT: PLEASE READ THIS LICENCE CAREFULLY BEFORE USING THIS SOFTWARE. By receiving, opening the file package, and/or using LSS Toolkit v1("Software") containing this software, you agree that this End User User LICENCE Agreement(EULA) is a legally binding and valid contract and agree to be bound by it. You agree to abide by the intellectual property laws and all of the terms and conditions of this Agreement. Unless you have a different LICENCE agreement signed by McCarthy Taylor Systems Ltd your use of LSS Toolkit v1 indicates your acceptance of this LICENCE agreement and warranty. Subject to the terms of this Agreement, McCarthy Taylor Systems Ltd grants to you a limited, non-exclusive, non-transferable LICENCE, without right to sub-LICENCE, to use LSS Toolkit v1 in accordance with this Agreement and any other written agreement with McCarthy Taylor Systems Ltd. McCarthy Taylor Systems Ltd does not transfer the title of LSS Toolkit v1 to you; the LICENCE granted to you is not a sale. This agreement is a binding legal agreement between McCarthy Taylor Systems Ltd and the users of LSS Toolkit v1. If you do not agree to be bound by this agreement, remove LSS Toolkit v1 from your computer now and, if applicable, promptly return to McCarthy Taylor Systems Ltd by mail any copies of LSS Toolkit v1 and related documentation and packaging in your possession. LSS Toolkit v1 and the LICENCE herein granted shall not be copied, shared, distributed, re-sold, offered for re-sale, transferred or sub-LICENSED in whole or in part except that you may make one copy for archive purposes only. For information about redistribution of LSS Toolkit v1 contact McCarthy Taylor Systems Ltd. The only authorised source of LSS Toolkit v1 will remain the website https://www.dtmsoftware.com It may not be hosted on any other site or device for download. Your LICENCE permits you to use as many copies of LSS Toolkit v1 on any number of devices as long as each copy has been sourced from the authorised website https://www.dtmsoftware.com. You shall use LSS Toolkit v1 in compliance with all applicable laws and not for any unlawful purpose. Without limiting the foregoing, use, display or distribution of LSS Toolkit v1 together with material that is pornographic, racist, vulgar, obscene, defamatory, libelous, abusive, promoting hatred, discriminating or displaying prejudice based on religion, ethnic heritage, race, sexual orientation or age is strictly prohibited. 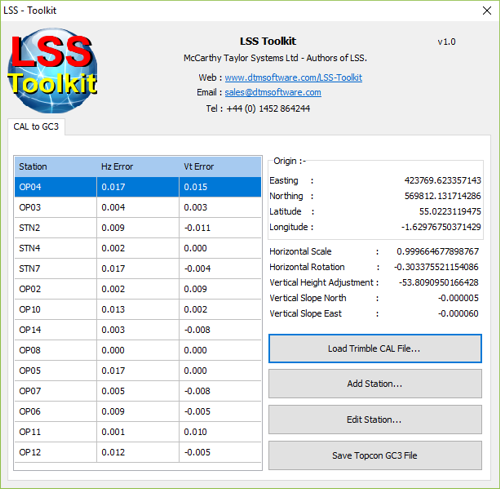 You must only download LSS Toolkit v1 from https://www.dtmsoftware.com. The assignment, SUBLICENCE, networking, sale, or distribution of copies of LSS Toolkit v1 are strictly forbidden without the prior written consent of McCarthy Taylor Systems Ltd. It is a violation of this agreement to assign, sell, share, loan, rent, lease, borrow, network or transfer the use of LSS Toolkit v1. If any person other than yourself uses LSS Toolkit v1 registered in your name, regardless of whether it is at the same time or different times, then this agreement is being violated and you are responsible for that violation! This Software contains copyrighted material, trade secrets and other proprietary material. You shall not, and shall not attempt to, modify, reverse engineer, disassemble or decompile LSS Toolkit v1. Nor can you create any derivative works or other works that are based upon or derived from LSS Toolkit v1 in whole or in part. McCarthy Taylor Systems Ltd's name, logo and graphics file that represents LSS Toolkit v1 shall not be used in any way to promote products developed with LSS Toolkit v1. McCarthy Taylor Systems Ltd retains sole and exclusive ownership of all right, title and interest in and to LSS Toolkit v1 and all Intellectual Property rights relating thereto. Copyright law and international copyright treaty provisions protect all parts of LSS Toolkit v1, products and services. No program, code, part, image, audio sample, or text may be copied or used in any way by the user except as intended within the bounds of the single user program. All rights not expressly granted hereunder are reserved for McCarthy Taylor Systems Ltd.
You will indemnify, hold harmless, and defend McCarthy Taylor Systems Ltd, its employees, agents and distributors against any and all claims, proceedings, demand and costs resulting from or in any way connected with your use of McCarthy Taylor Systems Ltd's Software. In no event (including, without limitation, in the event of negligence) will McCarthy Taylor Systems Ltd, its employees, agents or distributors be liable for any consequential, incidental, indirect, special or punitive damages whatsoever (including, without limitation, damages for loss of profits, loss of use, business interruption, loss of information or data, or pecuniary loss), in connection with or arising out of or related to this Agreement, LSS Toolkit v1 or the use or inability to use LSS Toolkit v1 or the furnishing, performance or use of any other matters hereunder whether based upon contract, tort or any other theory including negligence. Except as expressly stated in writing, McCarthy Taylor Systems Ltd makes no representation or warranties in respect of this Software and expressly excludes all other warranties, expressed or implied, oral or written, including, without limitation, any implied warranties of merchantable quality or fitness for a particular purpose. This Agreement shall be governed by the law of the United Kingdom applicable therein. You hereby irrevocably attorn and submit to the non-exclusive jurisdiction of the courts of United Kingdom therefrom. If any provision shall be considered unlawful, void or otherwise unenforceable, then that provision shall be deemed severable from this LICENCE and not affect the validity and enforceability of any other provisions. Any failure to comply with the terms and conditions of this Agreement will result in automatic and immediate termination of this LICENCE. Upon termination of this LICENCE granted herein for any reason, you agree to immediately cease use of LSS Toolkit v1 and destroy all copies of LSS Toolkit v1 supplied under this Agreement. The financial obligations incurred by you shall survive the expiration or termination of this LICENCE. THIS SOFTWARE AND THE ACCOMPANYING FILES ARE MADE AVAILABLE "AS IS" AND WITHOUT WARRANTIES AS TO PERFORMANCE OR MERCHANTABILITY OR ANY OTHER WARRANTIES WHETHER EXPRESSED OR IMPLIED. THIS DISCLAIMER CONCERNS ALL FILES GENERATED AND EDITED BY LSS Toolkit v1 AS WELL. You agree that McCarthy Taylor Systems Ltd may collect and use information gathered in any manner as part of the product support services provided to you, if any, related to LSS Toolkit v1.McCarthy Taylor Systems Ltd may also use this information to provide notices to you which may be of use or interest to you. Aspects of LSS Toolkit include software from Topcon Positioning Systems Inc. The following terms apply in addition to the general terms (above). 1. McCarthy Taylor grants to End-User(s) a non-exclusive licence to use the Software Application for End-User’s internal business operations under the terms stated in this Agreement. 2. End-User(s) shall not alter, reverse engineer, disassemble or decompile the Software Application. End-User(s) shall not copy the Licensed Software except: (i) as necessary to read the Software Application from the media into the memory of a computer solely for the purpose of executing it on a single machine (whether a stand-alone computer or a workstation component of a multi-terminal system), or (ii) to create an archival copy. End-User(s) agree that any such copies of the Software Application shall contain the same proprietary notices which appear on and in the Software Application. 3. End-User(s) shall not install, access or otherwise copy or use the Software Application except as expressly authorised by this Agreement. End-User(s) shall not distribute, rent, loan, lease, sell, sublicense, or otherwise transfer all or any portion of the Software Application, or any rights granted in this Agreement, to any other person without the prior written consent of McCarthy Taylor. End-User(s) shall not install or access, or allow the installation or access of, the Software Application over the Internet, including, without limitation, use in connection with a Web hosting or similar service, or make the Software Application available to third parties via the Internet on End-User’s computer system or otherwise. End-User(s) shall not modify, translate, adapt, arrange, or create derivative works based on the Software Application for any purpose. End-User(s) may not use or export the Software Application outside of the country of purchase for any reason. End-User(s) shall not assign, give or transfer the Software Application to another individual or entity. End-User is prohibited from (a) timesharing, service bureau, subscription service or rental use of the Software Application or (b) passing title to the Software Application any other individual or (c) publication of any results of benchmark tests run on the Software Application. End-User shall permit McCarthy Taylor to audit its use of the Software Application and report such use to McCarthy Taylor. End-User(s) acknowledge that the Software Application is the confidential information of McCarthy Taylor and its suppliers, and End-User(s) agree that under no circumstances may End-User(s) disclose the Software Application to any third party. Title to and ownership of the intellectual property rights associated with the Software Application and any copies remain with McCarthy Taylor and its suppliers. 4. Upon termination of End-User licence agreement for the Software Application, End-User shall discontinue use and destroy or return to McCarthy Taylor all copies of the Software Application and the Software Application Documentation. 5. End-User(s) are hereby notified that Topcon Positioning Systems, Inc. is a third-party beneficiaries to this Agreement to the extent that this Agreement contains provisions which relate to End-User(s)’ use of the Software Application. Such provisions are made expressly for the benefit of Topcon Positioning Systems, Inc. and are enforceable by Topcon Positioning Systems, Inc. in addition to McCarthy Taylor. 6. In no event shall McCarthy Taylor or its suppliers be liable in any way for indirect, special or consequential damages of any nature, including without limitation, lost business profits, or liability or injury to third persons, whether foreseeable or not, regardless of whether McCarthy Taylor or its suppliers have been advised of the possibility of such damages.